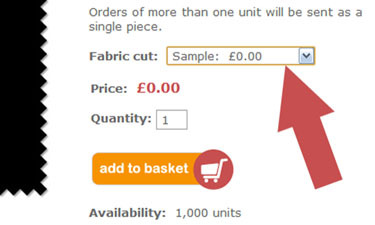 Buying fabric online can be daunting, and one of the biggest worries is that the fabric won't look the same 'in the flesh' as it does on your computer monitor. Here at Pelenna Patchworks we fully understand the need to see fabrics, especially if you are trying to match them to a current project or colour scheme. If you are only ordering samples, you will be charged a 50p postage charge. Simply go through the checkout procedure with the samples in your basket, providing your name and address, and we will receive the sample request when you complete your order. We will then send them out as soon as possible via Royal Mail second class post. Overseas sample requests will be charged the lowest postage band for the region, £1.60 for Europe and £5.15 for the rest of the world. If you are ordering samples along with other items they will be added to your order and there will be no additional charge on top of the standard postage. Please note that sample requests are limited to 10 per order, and only 1 sample of each fabric. If an order is made for more than 10 free samples only the first 10 on the order will be dispatched. We make every effort to send sample requests out as soon as possible, however at busy times standard orders take priority and there may be a delay of a day or two in sending out free samples. We reserve the right to cancel any orders where the ordering guidelines are not followed.